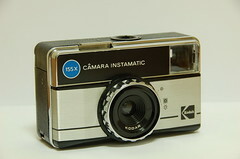 Kodak's 155X Instamatic Camera or 155X Câmara Instamatic was a viewfinder camera for 126 (Kodapak) film cartridges - one a large range of Instamatics. 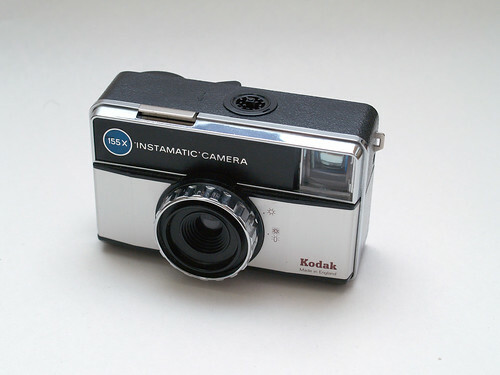 It was made by Kodak Ltd. in the UK, Kodak AG in Germany, and Kodak Brasileira Comércio e Indústria Ltda. between September 1971 and 1977. The only adjustment possible was by rotating the lens ring between symbols for Sunny and Cloudy/Flash, which changed the shutter speed. Film advance was by a combination thumbwheel with lever attached.